Whenever I tell a non-Chicagoan where I live, they usually perk up their ears and say "the Windy City." And while it's true that Chicago does indeed experience a great deal of wind, especially when it whips off Lake Michigan, legend has it that the term really came about because Chicago was said to be full of "hot air" in either boasting about some sports team rivalry with Cincinnati back in the 1870s, or in trying to lure the 1893 World's Fair (which Chicago won, and which apparently peeved New York - a losing competitor - to no end). Still, we do get a ton of wind. 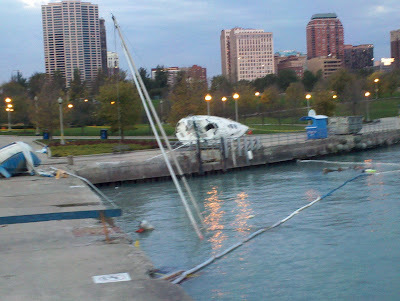 A few weeks ago, an incredibly powerful wind drove high waves into the harbor (even with a breakwall), causing 20 boats to lose their anchoring, and smash into the promontory wall (the left side of the picture). On Saturday, three remained submerged, and by yesterday morning, just one was still in the water.